Computer generated image of Sapphire Ring Cluster: Sapphire surrounded by Diamonds. 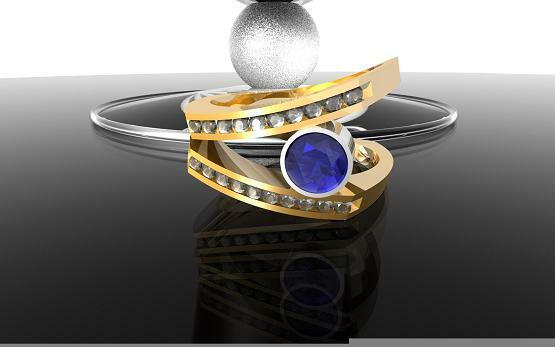 Computer generated image of actual white gold ring set with forty five princess cut (Square cut) Sapphires, and two eternity rings set with Diamonds. 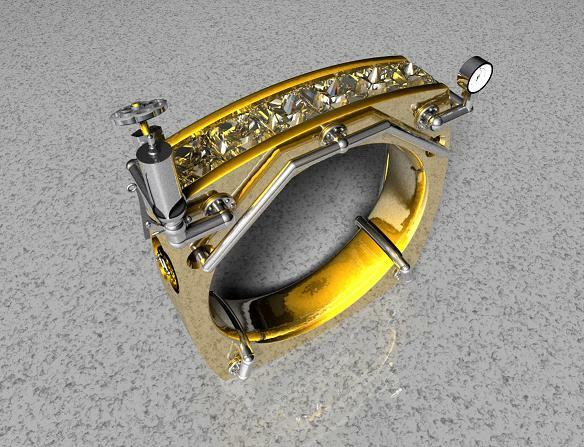 Platinum, 18 karat gold, and Princess cut Diamond computer generated steam powered ring. Looks like it could be steam powered anyhow. Used Pov Ray only to create ring. Ring could be created using a combination of CAD CAM, as in Artcam, or Rhinoceros, then cutting the wax with a cnc machine, or growing in a 3d printer then, casting, and fabrication. Another iteration of the Steam Powered Ring, but with Clear gemstones like Diamonds, and the body of the ring rendered in the clear gem material. Used Pov Ray to create the ring. Computer generated Ring. 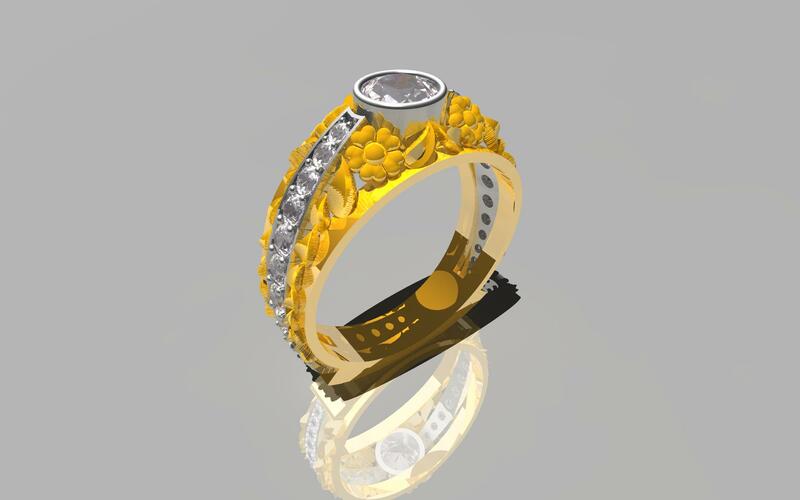 I first designed the ring using Artcam software, then exported an STL file to use in Rhinoceros, then exported a file for Pov Ray the raytracing program. Although this is a three D computer image it can be easily carved by hand as well as generated as a mill code ( Use Art2Part program to run cnc machine )or grow as a rapid prototype model. A Pov Ray rendering of a study in Artcam design. Yellow gold flowers and leaves around a Diamond set in a white gold bezel mounting. Computer generated Ring. Channel ring with four square shaped princess cut Sapphires in a platinum body with a yellow gold shank. 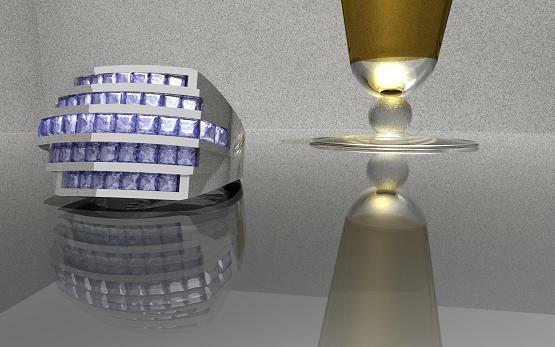 Although this is a three dimensional Pov Ray rendering it can be easily carved by hand as well as generated as a mill code or rapid prototype model using Delcam's Artcam Jewelsmith or Rhinoceros. Computer generated Ring. 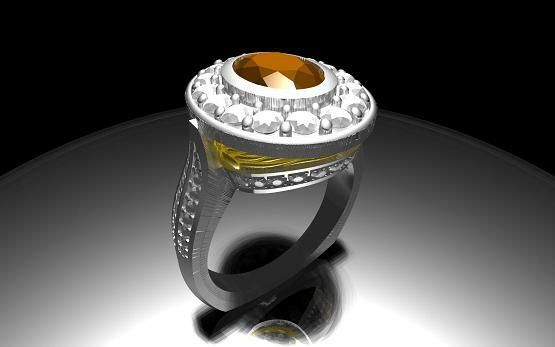 Padparasha Sapphire ring Platinum body with Gold Sun sculpture inserts. Gazebo Pendant. 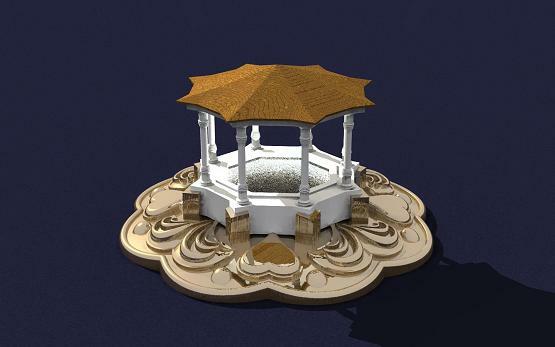 Gazebo first created in Artcam Jewelsmith as an addition to a study pendant design, then entire piece computer rendered in Pov Ray ray tracer. 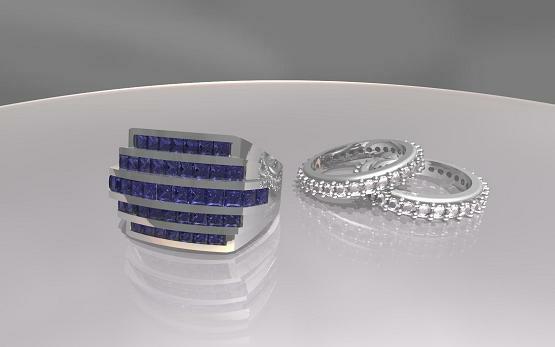 Computer aided design of a white gold ring set with forty five princess cut (Square cut) Sapphires. 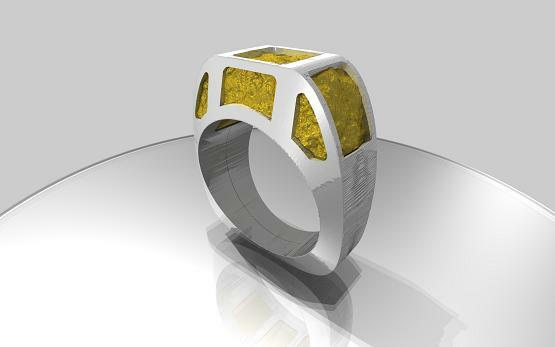 Image is a model of a real ring first designed in Artcam Jewelsmith. The beer glass was modeled after a real beer glass too. 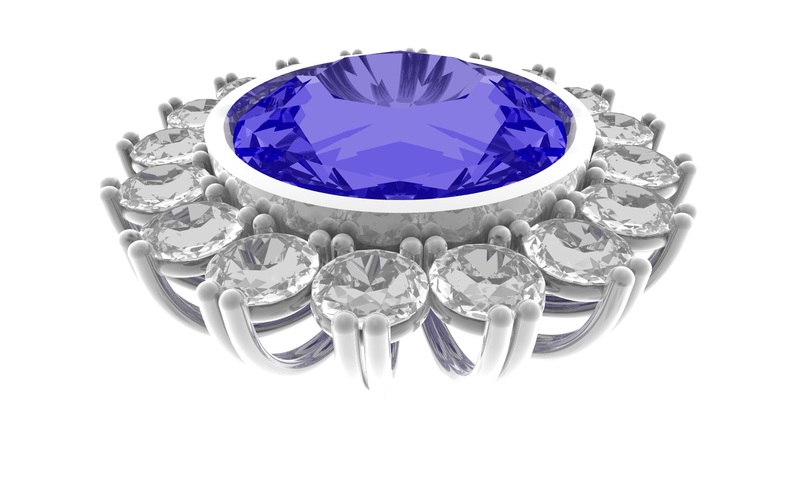 Computer generated image of an oval cut Sapphire set in a Platinum mounting set with Diamond accents. Computer generated image of an oval cut pink Sapphire in a Platinum and rich 18kt yellow gold and Platinum mounting set with Diamond accents. 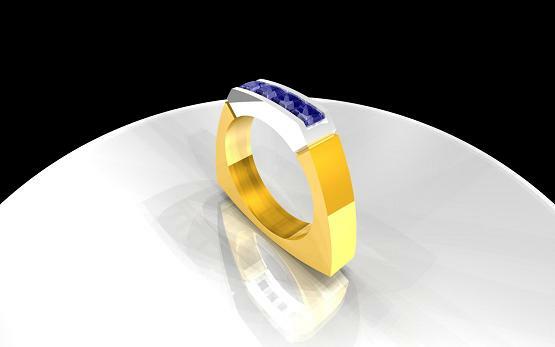 Computer generated image of a yellow gold ring set with Diamonds and a bezel set Sapphire. Computer generated Ring. Cocktail ring Platinum body with Gold Sun sculpture inserts.